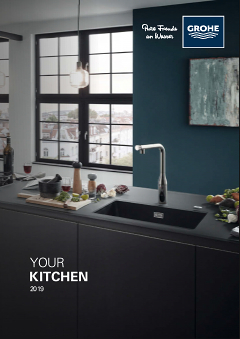 With its simple aesthetic composed of straight lines and right angles, this GROHE Eurocube range kitchen tap brings a touch of character to your kitchen design. Presented in the hard-wearing yet dazzling GROHE StarLight chrome finish, it will retain its flawless looks for years. Visually appealing and convenient at the same time, the high spout allows you to easily fill or wash tall pots, making it user-friendly as well as easy on the eye. The 360° swivel range means you have plenty of room for manouevre. The GROHE SilkMove technology is built in to let you vary water temperature and flow with ease and precision. And our easy installation system means fitting this sink mixer is fast and trouble-free. Celebrate the perfect square.